After nearly a year in development, Lift launched its first mobile product in August behind an ambitious goal: Boost human potential by helping people achieve their goals. It almost sounds New Age-y, but co-founders Tony Stubblebine and Jon Crosby are serious about doing their part to change the world by unlocking our inner achievers. The founders aren’t alone. From the get-go, Lift has been incubated and seed-funded by Obvious Corp., the hybrid accelerator created by Twitter co-founders Biz Stone, Evan Williams and early Twitter VP Jason Goldman. And now Lift is adding more believers to its support network, announcing today that it has closed a $2.5 million series A round, led by Bijan Sabet of Spark Capital, who joined the co-founders and Ev Williams on Lift’s board of directors. Obvious, SV Angel, Adam Ludwin from RRE, well-known personal achievement speaker and author Tony Robbins, Getting Things Done author David Allen, and Emmy-winning director and Twitter, Foursquare and Pinterest investor, Greg Yaitanes rounded out the startup’s series A investor list. In addition, Lift revealed today that it had extended its initial $600K seed investment from Obvious to include 4-Hour Body/Work-Week author and serial investor Tim Ferriss, Smile and Webshots co-founder Narendra Rocherolle and MessageBus CEO Jeremy LaTrasse. So what is it about Lift that attracted these business development and personal achievement experts? In part, it’s that altruistic mission to help anyone and everyone reach their personal goals. Of course, many startups are trying to crack the behavioral design nut — to find the right incentivization and motivation structures that can unlock personal achievement, be it by offering monetary rewards or subjecting users to peer pressure. But no one’s quite figured it out yet. The other conspicuous appeal of Lift is its simplicity. Ironically, it took the founders almost a year of tinkering to design the right concoction of simple for Lift’s mobile experience. 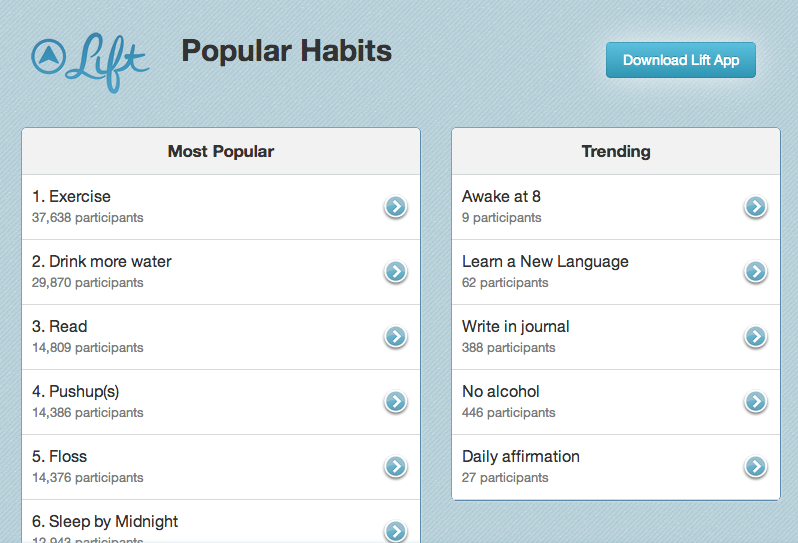 At first glance, there’s not much there: After downloading Lift, users can create or join “habits,” clicking Lift’s big button if they’ve met their goal that day. Plus, as Lift’s activity is all public, users can give (and receive) support to others in the community based on the successes of their peers. 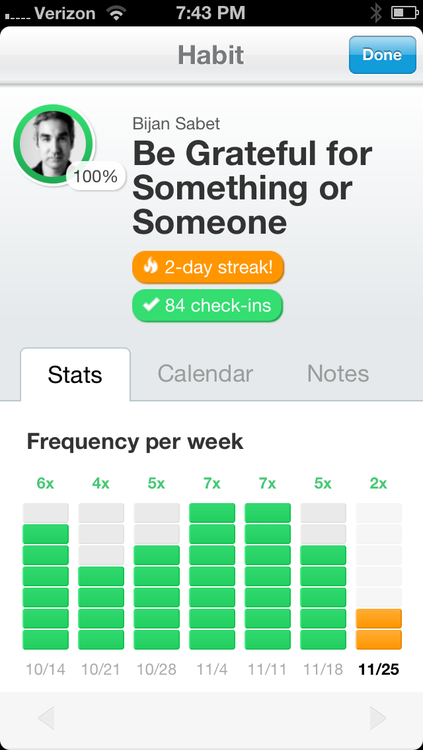 As the app tracks user progress, it populates its graphs and charts with your data, showing just how consistent you’ve been in sticking to your positive habits. That’s about it. Initially, the co-founders added a bunch of gamification elements to the apps, but they quickly learned that users weren’t interested in badges or prizes. They just wanted simplicity. So, the team stuck to its guns, focusing on the creation of a simple, portable support community that can help you reach your goals by consistently reinforcing your most productive habits. However, the most common support systems used today still have “uneven availability and validation,” Stubblebine said in a blog post today, and people suffer from too much choice. We shouldn’t be forced into choosing between 100 sets of advice, $100 support sessions, in-person meetings or fall back on the products that are the most aggressively marketed. Instead, the co-founders want Lift to be universally applicable, working just as effectively for dietary goals as for goals that are more within reach, like calling your brother on his birthday or drinking more water. Lift plans to release a new version of its mobile app at the end of the year, which Stubblebine says will take big strides towards the universal. He also tells us that Android, web, and mobile web apps are on the radar, but that the team has really been focused on nailing its iOS product — so cross-platform availability is likely a ways off and it’s not yet clear which they’ll prioritize. To that point, Lift’s new funding has allowed it to make a couple of engineering hires (including Matt Matteson on the iOS side, who was employee numero uno at Path), growing its team to six, with several more to be added in the near future. We’ve also confirmed that Plancast Founder and former TechCruncher Mark Hendrickson, who joined Lift as head of product back in March, has left the company to pursue his own entrepreneurial aspirations. Although Hendrickson was only at Lift for about 8 months, both he and Stubblebine confirmed that the departure was amiable. It should be fun to see what Lift is cooking for its end-of-year release. The company has a strong support network of its own, thanks to its new capital infusion and backing from the guys behind Twitter, but it still has a lot of work left to do if it’s going to prove that it can find a significant, engaged user base outside of the data-happy confines of Silicon Valley.